Tag line: "Rangers Lead the Way"
French politician George Clemenceau once said, “War is a series of catastrophes that results in a victory”. Ridley Scott's 2001 film Black Hawk Down begins with a quote of its own, from Plato: “Only the dead have seen the end of war”. But for the U.S. personnel who fought that October day in Somalia, there was only one credo that mattered: Leave no man behind. Black Hawk Down details the events of October 3, 1993, when a joint venture of U.S. Army Rangers and Delta Force Special Ops carried out a daylight raid in the city of Mogadishu, Somalia, the goal of which was to apprehend two lieutenants of Somali warlord Mohammed Aidid (having established his military strength by way of brutality and violence, the United States set Aidid's removal from power as their top priority in the region). At first, the operation goes according to plan, and both lieutenants are quickly taken into custody. But then a Black Hawk helicopter is shot down. Before the sun would set, another Black Hawk joined it on the ground, and suddenly the mission shifted from an extraction of prisoners to one of recovery and rescue. The Rangers and Delta Force operatives who went into Mogadishu found themselves trapped in a hostile city, with few provisions and limited medical supplies. In all, 19 of them lost their lives. Black Hawk Down is a technically amazing motion picture, from its crisp editing to the beautiful cinematography of Slawomir Idziak. When the first Black Hawk helicopter, piloted by C.W.O. Cliff Wolcott (Jeremy Piven), is struck by enemy fire, director Scott provides us with a dual point of view, establishing the action both inside the doomed craft and at ground level. These shots are quick, yet not so fast that we lose our bearings, and, when the aircraft goes into a tailspin and crash lands, there is a moment of total silence, broken only by the chilling radio announcement that “Super Six One is down”. 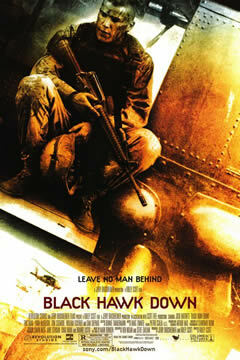 With its realistic, often nerve-wracking battle scenes, Black Hawk Down is an uncomfortable film to sit through. And yet its gritty depiction of warfare was absolutely vital to telling this particular tale, for it was only by making Black Hawk Down as accurate an account as possible that the filmmakers could be sure no man’s story was left behind. Would love to either see the movie or read the book. Did read his 'Killing Pablo', Escobar that is, which just drills home the utter stupidity of the 'War on Drugs' which pretty much created Pablo as someone to be reckoned with and then, with his death, created a MUCH worse thing.